Observation - Tulip Bulb Pest - UK and Ireland. Description: I found these small segmented creatures in holes in my tulip bulbs when I was repotting them very late in the season this year. Does anyone know what they are? Did they make the holes or move into them? 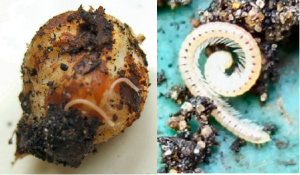 I found these small segmented creatures in holes in my tulip bulbs when I was repotting them very late in the season this year. Does anyone know what they are? Did they make the holes or move into them?